Neousys’ PB-2500J series is an innovative power backup solution for demanding industrial applications. Utilizing ultracapacitor technology, it features -25 to 65°C operating temperature range and extremely high durability. Compared to traditional battery-based UPS systems, PB-2500J series sustains superb reliability in extreme temperature environments and eliminates the drawback of battery performance degradation over time. PB-2500J series is composed of eight 100F ultracapacitors to provide 2500 watt-second stored energy to sustain your computer during power outage and depending on your system’s power consumption, it could be from seconds to minutes. But what makes PB-2500J novel is its patented CAP Sensing technology, an on-board processor that constantly monitors power consumption and evolves with the system. During a power outage, it maximizes the system operation time by estimating the perfect time to initiate system shutdown to prevent data loss. PB-2500J series is available in two form-factors. 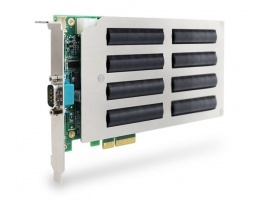 PB-2500J-PCIe is a plug-and-play PCIe card specifically designed for Neousys’ Nuvo-5000 and Nuvo-6000 series; and PB-2500J-CSM is a standalone module similar to UPS, it can be used for any embedded controllers with a DC input. When it comes to industrial embedded controllers, stability and data loss prevention during power outages are just as important. Neousys’ PB-2500J series aims to do the latter by redefining reliability and taking it to another level. With PB-2500J series, unexpected power loss and unstable power lines are a thing in the past!